Microsoft understands that most people just want technology that solves real world problems like ID theft, online fraud, and child safety. But End to End Trust cannot be realized through technology—we must also align technology innovation with social, political, economic, and IT forces. 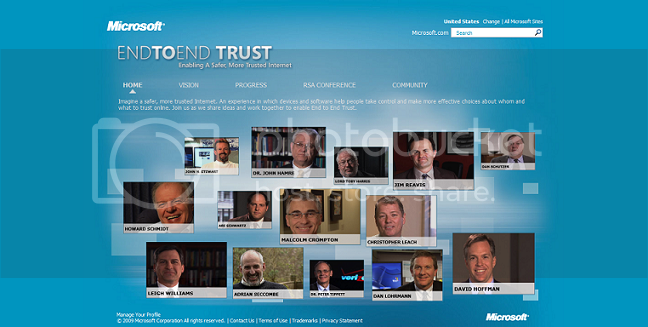 To this end, Microsoft recently launched a new End to End Trust Web site. The site includes a video wall that features CEOs, Chief Information Security officers, founders of computer security alliances, and other influencers. Watch these videos to learn more about End to End Trust. Want to participate? Visit the community page. JnzmT0 Glad I’ve finally found sotmeihng I agree with!